Anyone can get a marriage license in Colorado regardless of your citizenship or residency as long as you’re older than 18, can prove your identity and aren’t currently married. Identify your most convenient County Clerk of Court – you can visit any county clerk in the state, it doesn’t have to be the county you reside in or the county you’re getting married in. Make an appointment and apply online – although the process is very short, making an appointment is recommended just in case there’s line. And don’t worry! Your application can’t be denied, they just want to get your info digitally ahead of time instead of filling out a paper form in the office. Be sure to note any holidays or other office closures near your wedding date! Both partners need to show up in person to snag a license. If that’s not possible, at least one member of the couple can show up with a notarized power of attorney form authorizing their partner to obtain a license on their behalf. Once it’s your turn at the counter (should be pretty quick since you made an appointment!) you and your partner will be asked to show your state ID or passport, raise your right hand to swear you are who you say you are, and pay $30. If you’ve been married before, they’ll ask for proof of the dissolution of your previous marriage. And that’s it! They’ll give you one ‘ceremonial copy’ of your license. This is the copy you keep forever, so try not to fold or damage it! You have 35 days to sign this copy, and then 65 days from your wedding date to return it or you’ll be assessed a late filing fee. 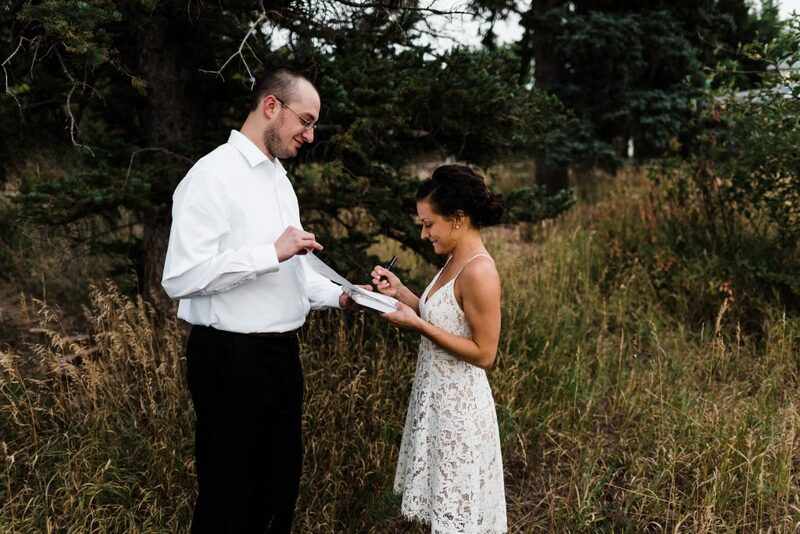 Bring your license to the ceremony and have your officiant fill out the details and sign with their official title. (All Simply Eloped officiants are ordained ministers capable of legally signing marriage licenses!) You’re not required to have witnesses, but if you have friends and family celebrating with you, it’s a nice gesture to choose two people to sign with you! Important note! Your names will be printed on the top of the license and designated as Party 1 and Party 2. It is very important to pay attention here and sign in the appropriate field. If you’re changing your name, you’re welcome to sign with either your new name or your former name. I recommend practicing ahead of time! Find a way to return your license to the same county clerk you got it from. You can go in person (recommended) or mail it in (definitely send it certified mail if you do!). They’ll notarize your ceremonial copy and return it to you. At this time you can request certified copies for $2 each. For a basic name change, I recommend getting 4-6 copies. If you own a business or multiple real estate properties, you should make a list of every account you have and grab one certified copy for each.